Proud Acura owners tend to be unusually tech-savvy, and source their aftermarket and genuine Acura parts online from stores such as CPD, instead of overpaying at the customer service counter at their local dealership. These are exactly the same components as those sold at the auto dealer, however our massive buying power and minimal markup means huge savings for our customers. Discount aftermarket replacements are another great option, which are brand-new pieces that are functionally identical to the genuine factory versions, but without the outrageous cost. The third and least desirable option is buying used, but unfortunately those items are usually nearly as worn-out as the used bits being replaced, and can immediately fail and necessitate yet another expensive replacement. Acura, the luxury and high performance division of The Honda Motor Company, was launched in 1986 as a division of the first Japanese luxury performance automobile brand. Initial offerings included the Accord-based Legend and Integra, which were very well received in North America and inspired Toyota and Nissan to release their own luxury brands, Lexus and Infiniti respectively. In 1991 the automaker introduced the high-performance hand-built NSX sports car with forged components such as pistons and titanium rods, which was designed to compete with Porsche and Ferrari supercars but retain everyday driving ability and typical Honda maintenance costs. Acura has performed extremely well in the motorsports arena with its Integra, NSX, RSX and TSX sports cars, and has earned an outstanding reputation in the crossover SUV market. The high-revving engines, excellent part quality control, performance-biased handling, and terrific reliability make the Acura brand a favorite with enthusiasts and commuters alike. Skip the used equipment and go with new genuine OEM or aftermarket, for maximum peace of mind and minimal installation expense. Don't wait - view CPD's online aftermarket and genuine parts catalog today and find out how much you can save! 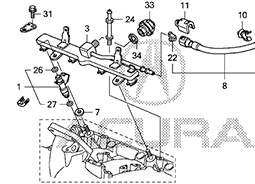 CarPartsDiscount.com is not associated with the Honda Motor Company, LTD. All images and references to the Acura name, vehicle model names, logo and shapes are for reference and identification only. All trademarks, trade names and/or service marks are the property of their respective holders.